Stolen Years is a self-published title, and the only negative thing I can say about it is the dull cover, which gives no indication of what type of story the novel tells. It’s a common fault of self-published books and is driving me slightly mad, as I confess to shamelessly choosing books by their covers. But despite this, Stolen Years had me riveted, and I would highly recommend it – in fact I’m giving my copy to my Mum, so I can’t give higher praise than that really! 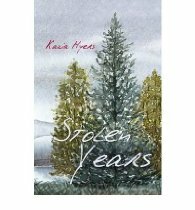 Stolen Years is told by Anna, a seventeen year-old girl who along with other teenagers, is taken from her family in Poland and transported to Austria, with the promise of well-paid work. But it’s a lie – and Anna and her friends are to be used as slave labour on Austrian farms, watched over by the dictatorial farmers and the ever-suspicious eyes of the Gestapo. The conditions are harsh and the punishments for the slightest transgression are brutal. Anna and her friends struggle to survive, but their friendships are the one thing they can count on, and Anna starts to fall in love with the gentle Michal. But war is no friend of love, and they are forcibly separated. Will they ever find each other, and is there any hope of one day returning to Poland, in freedom? This story is beautifully told, and I felt a deep empathy with Anna, who is spirited character. The plight of Polish slaves was not an aspect of the war that I really knew about, so events in this story deepened my understanding of the impact of war on Eastern Europe. There are moments of utter horror – the Gestapo’s punishment of Stefan and Lilli made me feel faint; and anger – the British soldier’s treatment of Anna is shocking. But there’s also compassion and balance, as we see a different side to the Austrian authorities in bitter but sad Umtraut, and honourable Dieter. The ending, quite simply, made me cry. Stolen Years is a compelling story, which adds to the understanding and remembrance of the Second World War with its sensitive and thought-provoking narrative. This is an excellent novel, and proves absolutely that self-published writing can be of very high quality.